Originally from Summerhill, Dublin, Lynn Rafferty pursued acting from a young age going on to train for three years at Bull Alley Theatre Training Company, followed by The Gaiety School of Acting in Dublin. She then went on to study comedic improvisation at Second City Training Centre in Toronto, Canada where she currently resides. Perhaps best known for her role as Nadine in multi-award winning gangland drama ‘Love/Hate’, Rafferty is also an accomplished writer and comedic performer. Lynn wrote and starred in ‘The Arrival’, winner of six short film awards, including three Best Actress Awards. Other recent television credits include ‘Ripper Street’ for Amazon, RTE’s ‘Rebellion’. 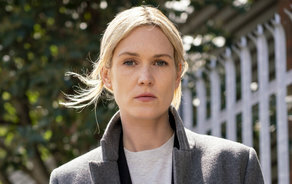 Most recently, Rafferty starred in the hit RTE crime series ‘Taken Down’, where her character Detective Jen Rooney, investigates the violent death of a young Nigerian migrant whose body is found near a Direct Provision Centre. IFTN journalist Nathan Griffin caught up with Lynn ahead of the festive season. What Irish talent have you been impressed with this year? Viewers can catch Season 1 of ‘Taken Down’ on the RTÉ Player.